Are you as excited as we are that college football starts next week?!?!?! A couple of years ago, the nice folks at Go Chic! 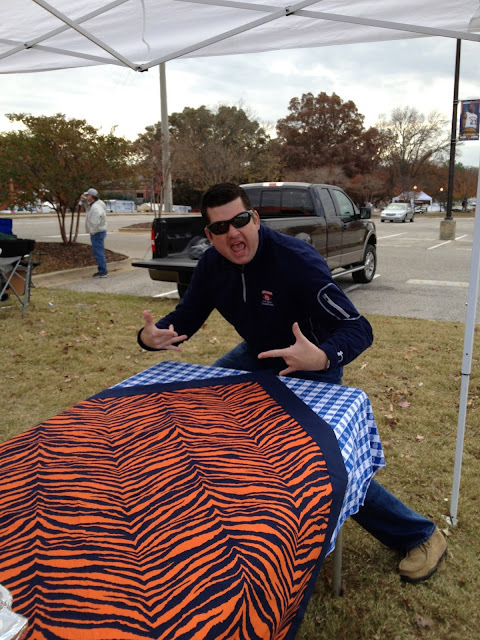 sent me an AUsome tablecloth for our tailgate. It was really nice, and Chicken Legs really loved it (as you can see). I reached out to Go Chic and see if they would be interested in sponsoring a giveaway and they happily agreed. Go Chic! can cover all your party needs! They have tablecloths, pillows, napkins, trays, cups,clothes, jewelry, totes and so much more. They can even outfit your dog or cat for the big game! Don't worry, they have other teams than Auburn. I am totally dying over the scarf! It is going on my Christmas List along with the tote bags! I would love to have that Gameday Menu sign too! Really, I just want everything! Go Chic! is giving one lucky Plain Chicken reader a $100 gift card to their store! The giveaway ends Friday, August 30, 2013 @ 11:59 CDT. The winner will be notified by email and has 48 hours to respond. If the winner does not respond within 48 hours, a new winner may be selected. Good Luck! I would love to get a couple of the design your own toss pillows! So cute! love college football season! thanks for the contest. Love the beverage tub and the wreathe! I would get Design Your Own Team Tablecloth. The tablecloth is so fun! I love the Gameday Menu chalkboard! Anything Husker related would be great! I love the 6 Piece Chill Out And About Cooling Tray Set, I love salads and this would be terrific to keep salads cold, and safe. Cool! I definitely need a scarf and tablecloth! I really like the tablecloths and I love the necklaces! I like the pillows and tote bags. I'm an Ohio State fan though! Scarlet and gray all the way! So many things...but first on my list would be the insulated monogram tumblers...with chevron print! I am in love with the scarf also!! Gotta design my tablecloth! Then I'd spend the rest on Woozies for me and my girlfriends!!! I am loving the scarves!!!! That is what I would buy! Gorgeous!!! I would buy something LSU related and I am relieved to know you are not an Alabama fan, LOL! Love it!!! Roll Tide Roll!!!! So much to choose...so little time!! But it would have to be IL or MO colors!!! The scarf for sure! Love! What's almost as great as Football??? There are so many nice items to choose from! I would order the beverage tub with a big War Eagle band!! I want it all!! ;-) Anything would be amazing!! I would have loved to get that scarf in purple & gold but since it doesn't have those colors...LSU necklace & earrings! Go Tigers! I would love to get some "house divided" items. We root for Texas Christian University Horned Frogs and also for the Texas Tech Red Raiders. My team recently entered the SEC and oh my what the years will bring in that division!! Go MIZZOU!!!! would love to have a tote, but the scarf is to die for! Roll Tide :) Would love to win anything Roll Tide! I love the scarf! So fun! I'd have to get the Arkansas garden statue for my parents. Go Hogs! They have some really awesome things! Thanks Stephanie!! The Design Your Own Team Tablecloth 52 x 52 in. I'm Loving that infinity scarf! Really like those fitted tablecloths. Thanks for the chance to win. Such a hard choice but probably a tote and or football. Go Dawgs - red and black tablecloth! What a fun giveaway...I love football and tailgaiting! I would love an Alabama scarf! Loooove the scarf! I would definitely have to buy one if I win! I love the tote! But I would have to get the garden statue for my porch. I would love to get scarves for me and my sisters! Any and everything Mississippi State!! I would def check out the pet gear! I can't wait for Texas A&M football!! Out here in AZ, we have the All SEC Kick-Off Party TODAY! I'm like you, the scarf and the totes. Thinking I'd get the garden statue for our yard! I would love to have the tote and a new tablecloth! They are just wonderful. I think I would buy the tote or the menu board. Everything is adorable! Oh wow! Y'all are going to make gift-giving a lot easier for me! I would buy the tumblers, tablecloth, wreath garden statue, etc.....! I would buy a tablecloth just like yours! (And if I see that tablecloth in use next weekend, I'm going to stop and see if it's you.) WDE! Love the table cloths and totes! 18 in. Directors Chair! Cute! I would buy some tumblers and a cute football sweater for my dog! One of the things I would buy is a Go Tote in black. I would totally love a cute scarf for the fall games! I would love the totes or the scarf, too! Go Wildcats!!! I would pick the scarf and throw pillows. I would love to buy 2 of the Classic 18 in. Director Chairs though I'm still looking over their great products. Thanks for the giveaway. Love the scarf!! Thanks for a chance to win Steph! Love the bags! Actually love it all! Love the scarf and beverage tub and tote! So ready for college football. GO DAWGS. I would like to buy a UGA necklace. Thanks. Love your blog! I check it almost daily. I would love any & everything Tarheels! Thanks for the contest! Love your blog. I would get an Alabama National Championship Jacket. I would get my dog a custom pet bed. Love the tablecloth and scarf! I love it all...in houndstooth and crimson (Roll Tide!). I especially love the menu board and tablecloth, though! Love your blog too:). Can't wait for college football season to start! We don't tailgate since Seattle is a little far from Tuscaloosa but an Alabama scarf, tote and a few other items would be great. I also love your Meow Mondays and your blog is AUsome ( I am praying for forgiveness for that as I speak). Those totes are adorable, I'd love to have one! Love love the gameday menu sign, in LSU colors, of course! I would probably get a tote! Anything Gators to outfit my table for tailgating at the Swamp. Guzzini Large Vintage Square Bowl! I'd have to get the dog something. Tough decision, love the scarfs. Want it all! I would get some napkins and a mini memo board. I am SO ready for college football season to start. I would love the scarf, or the tote, or maybe the napkins...tough decision! scarf is cute as is the tote bag. I am a sucker for a cute scarf and tote! I'm so all over the scarf! In Gopher colors!! I'd love to get a beverage tub and a Go Tote! So excited for football season! War Eagle! So many cute items. I loved the drink tubs with the custom bands! Thank you. a blue and gold infinity scarf! Those are fab! I need that infinity scarf and some of the throw pillows! I would get an infinity scarf, and 8 piece chill out set, and one of those really cute tubs to hold drinks. 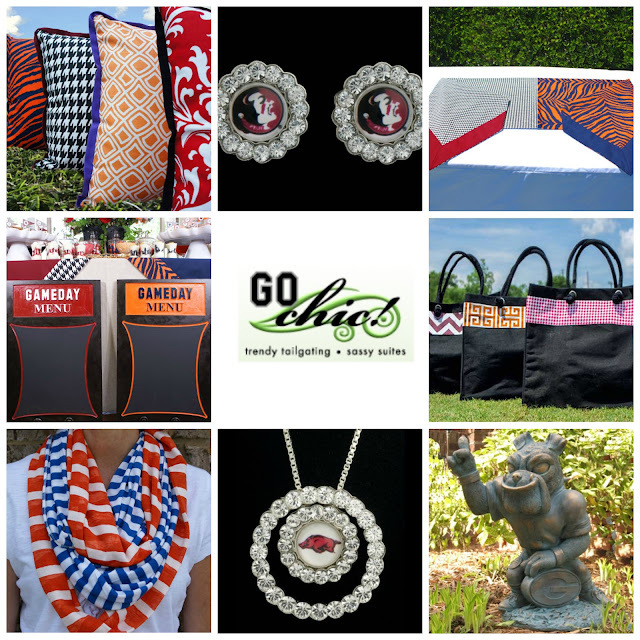 I love the Go Totes & the infinity scarves! I would but some of those fab square vintage bowls! I would love the throw pillows! I love this; too cute! I would probably get a couple of the throw pillows or a tote. Super cute, love the scarf! I would like a couple of director's chairs, with coordinating tailgating tablecloth and tote. If you're gonna go, GO BIG! The scarves and bag are so cute! I would get the Georgia Bulldog yard statue. How fun! Loving the Beverage Tubs & Director Chairs!! Thanks so much for the opportunity! Roll Tide and Go USA Jags! The NC State garden gnome needs to be at my house now! The totes are super cute! I love, love the Tent Lighting! Cutest idea ever! I would love to get my stepmom something. She's a big USC fan! I would get a Infinity Scarf and a couple custom beverage containers with the ribbon! I can't decide! I want it all! My brother went to Auburn = wears his hat when he visits in LSU country...brave guy. I would buy a Beverage Tub and some other items from the Entertaining Essentials category. I would buy the scarf! So cute!! I'd buy the University of Kentucky Circle Earrings. I want the tote bag you posted on IG!!! I think I would get a couple of those directors chairs...they are cute and I need them for my porch. I would love to get some insulated tumblers or a round table cloth for my round table! I would buy a University of Missouri Circle Pendant with Chain. I'm always looking for new tailgating accessories for T-town! Lots of cute stuff! I would love to get some of the Guzzini Serving Bowls and Trays. Thanks so much! Love the chandelier and chalkboards!! We are a house divided, so we are always looking for new things for football season! War Eagle! I love the pillows and the chandelier. I would buy pillows and a blanket they have a lot more I want.